Seal of Indiana (public domain image on Wikipedia). A state seal was provided for in the 1816 and 1851 Indiana constitutions, but it was not until 1963 that the Indiana General Assembly provided an official description for the state seal. 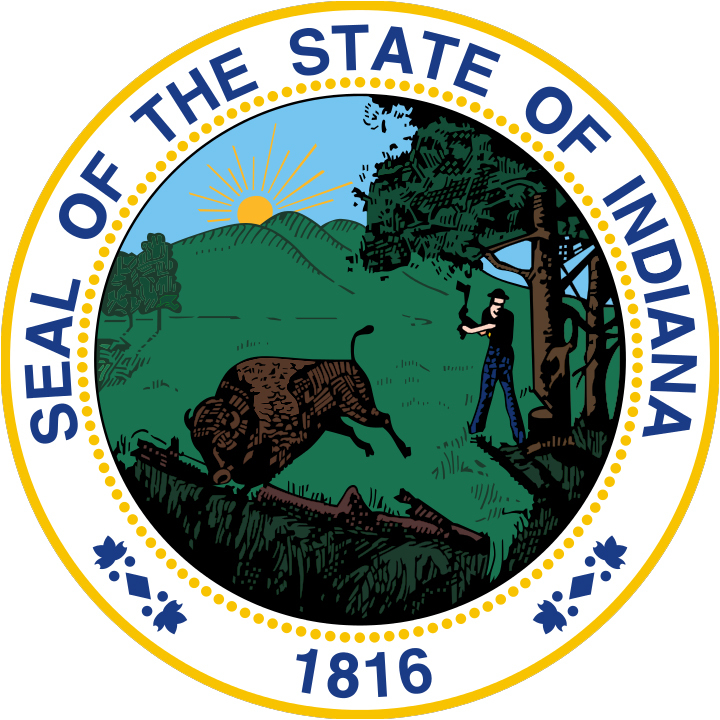 The Indiana seal design consists of a woodsman chopping a tree with his ax, a buffalo jumping over a log, sycamore trees, hills in the background and a setting sun with fourteen rays. The leaves of the Indiana state tree (tulip poplar) border diamond shapes in the outer circle. The words "Seal of the state of Indiana" appear at the top of the outer circle and the date Indiana entered the union (1816) appears below.